Ely Place seems to have formed almost by accident in 1768. 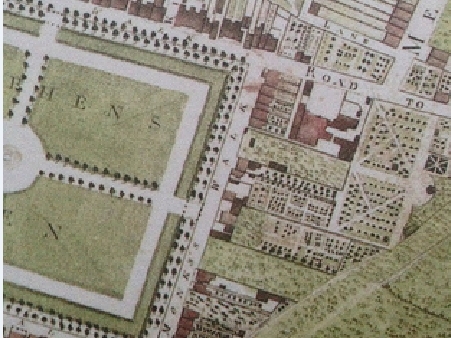 Rocque’s 1756 plan of the city shows that the east side of St Stephen’s Green had some vacant plots, including one plot that aligns with what is now Hume St. Perhaps spotting an opportunity to increase the earning potential of the land area, Gustavus Hume (the man who brought Richard Cassels to Ireland) constructed Hume St. With Ely House the first house to be built in 1771 at the end of Hume St, the connection from Merrion St turning the corner to Hume St—thus forming Ely Place—was a natural result of the new arrangement. The name Ely comes from the marriage of Gustavus’ daughter to the Earl of Ely. Maurice Craig notes—with some satisfaction I feel—that not only were these city streets adjacent, but the ancestral homes Ely Lodge and Castle Hume are also side by side in Enniskillen (Craig, 1952). 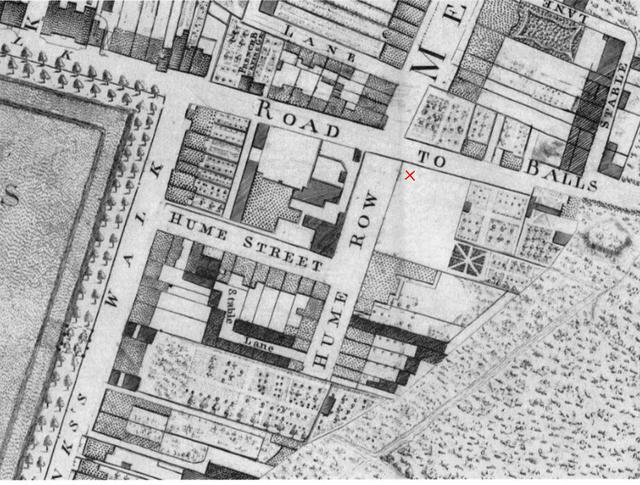 Hume’s work was captured on Scalé’s update of Rocque’s map in 1773, although Ely Place was called Hume Row, until Ely House was built (Irish Builder, 1893). By the time Dublin was mapped again in 1789, it is recorded as Ely Place. Since then, Ely Place has enjoyed a significant status. Even as the shift away from Dublin hit St Stephen’s Green in the 1820s and 1830s, Ely was quoted as being “more select” (McCabe, 2011). Ely House, now Nos. 7 – 8 is the largest house on the street. It was the first to be built, and is clear to see on Scalé’s map, facing Hume St. No. 7 was home to the physicist and Trinity Fellow George Francis Fitzgerald, and there is a plaque in his honour, the first of three plaques at this junction. All the family pictures now at Powerscourt… had been removed by Dowager Lady Powerscourt sometime in my father’s minority and before his marriage. He was determined to recover the pictures, and on occasion when Isabella, Lady Powerscourt, was absent he went to the house with a van and carried off all the pictures and brought them back to Powerscourt. Doorway of Hume House,birthplace of Richard Griffith taken in 2012. Powerscourt did however install a new staircase in the 1830s. Soon after the Dowager’s death in 1848, No. 6, along with its pair No. 5 (Glentworth House) had a very different use—they were given over in 1859 to the Offices of the General Valuation and Boundary Survey of Ireland under Sir Richard Griffith, becoming the nerve centre of his enormous land valuation survey. Griffith’s birthplace was just opposite, at the junction of Ely and Hume. Marked with an old plaque, it is now neglected—a sad testimony to the man involved in every major undertaking in 19th century Irish administration: Bog Surveys, Ordnance Survey, Griffith Valuation, Census. For good measure, he is also father of Irish geology, having been Professor of Geology and Mining at the Royal Dublin Society. The Valuation Office moved out in 1998 to the Irish Life Mall. The extension of Ely Place towards the Royal Hibernian Academy was originally called Smith’s Buildings, with Thomas Dodd Smith, builder living at No. 1. Not sounding grand enough, its residents opted instead for the name Ely Place Upper. 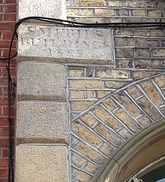 A stone quoin with the engraving “Smith’s Buildings” is visible at No. 1, of the 5-block terrace at the end of Ely Place Upper. The third plaque is dedicated to George Moore, who lived at No. 4 Ely Place Upper, and apparently made use of the garden at No 15, opposite, now the site of the Royal Hibernian Academy (Moore, 1966). The Tinker, by Douglas Hyde, first President of Ireland, was played in the garden in 1906, as Gaelige (Daly, 1945). It seems everywhere you look on this street, there is something to commemorate with a plaque! Dublin Street Directory for Ely Place. The Dowager is at No. 6. 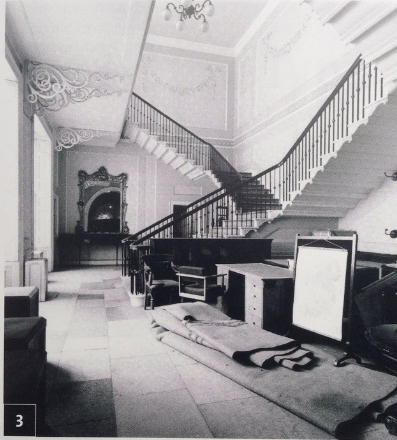 If plasterwork is your thing, Christine Casey (2005) has a lot to say about that, along with Ros Kavanagh, both of which feature a picture the staircase at Ely House. (Christine Casey,2005, The Buildings of Dublin, Yale University Press, Ros Kavanagh, 2007, Irish Arts Review, 24(3), 80 – 83). Niall McCullough’s gorgeous book also has a lot about the architecture of Ely Place, including a picture of the kitchens at Ely House, architectural plans for No. 5 and No 6, and pictured here, the impressive entrance hall and staircase at No. 6. (Niall McCullough, 1989, Dublin: an urban history, Anne Street Press). Old Dublin Mansion Houses, The Irish Builder, 1893, XXXV, May 1, 100 – 102. Maurice Craig, 1952, (2006 repr), Dublin 1660 – 1860: The shaping of a city, Liberties Press. M. H. Daly, 1945, La Touche Bridge to Hoggen Green, Dublin Historical Record, 7(4), 121 – 133. Desmond McCabe, 2011, St Stephen’s Green, Dublin, 1660–1875, Government Publications, Dublin. Desmond F Moore, 1966, The Royal Hibernian Academy, Dublin Historical Record, 21(1), 28 – 37. Mervyn Wingfield, 1903, A Description and History of Powerscourt.